Persian and Turkish architecture, textiles and miniature paintings inspire the precise, stylized floral forms that compose Anila Quayyum Agha’s sculptural chamber of light and shadow. This luminous installation provides an opportunity to contemplate the differences and commonalities that shape our lives and relationships. Originally from Lahore, Pakistan, and now living in the US, Agha is acutely attuned to the social codes that inform the lives of Muslim women and all immigrants. She describes this work as her effort to create a sense of how women can reclaim and safely open up private space to welcome others. Share your impressions with us on social media using #AlltheFlowersAreforMe. All the Flowers Are for Me is a variation on Anila Quayyam Agha’s award-winning 2014 work Intersections, which PEM presented in 2016. With Intersections, Anila Quayyum Agha creates instant architecture in an empty room. 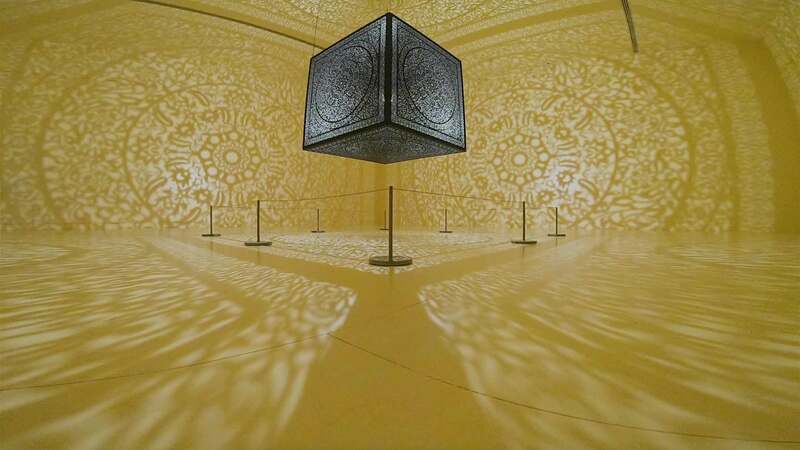 A laser-cut steel cube suspended from the ceiling and illuminated by a single bulb casts intricate shadows across the walls and the people who enter the gallery.